*FUN FACT: ALL THE GIFTS ARE UNDER $45! 1. 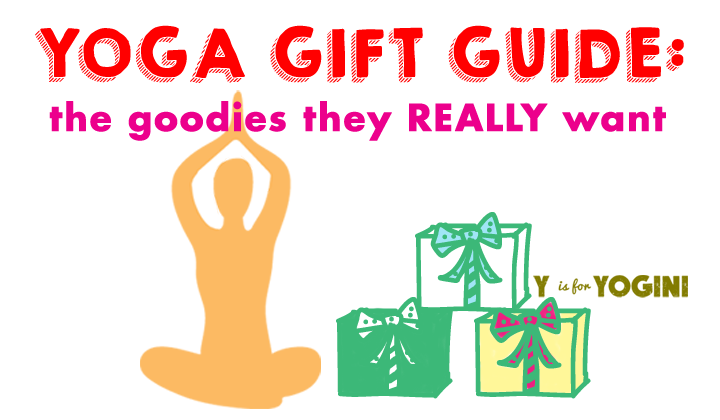 Yoga Lifestyle Box (YOGI SURPRISE / $39.46 per month right now, regular price: $44.95 per month) – It really was a delicious surprise to discover how jam-packed these monthly subscription boxes are with awesomeness! I’ve received two so far and my favorite goodies include a yoga cookie cutter, breathwork book, lavender sachet, organic herbal tea, and Yogi Surprise’s cute little sequence cards. Shipping is free in the U.S., you can cancel whenever you like (though you likely won’t want to), products are full-size, and it’s something special to look forward to every month. It’s the gift that keeps on giving! Perfect as a gift for self or for someone you adore. 2. Savasana Champion Sweatshirt (SKREENED / $44.99) – Want. How funny-cute is this?! It’s available in many, many different styles (as are all items at Skreened, which I love) including men’s tees, unisex tanks, baseball tees, hoodies, kids’ styles, and accessories (pillows, tote bags, dog shirts). Sizes range from XS to 2XL. Plus, there’s always a helpful coupon (free shipping, % off) to be found. 3. How to Do Yoga Mug (UNEMPLOYED PHILOSOPHERS GUILD / $14.95) – Rather than your usual cheeseball mug fare, this one is kinda fly. 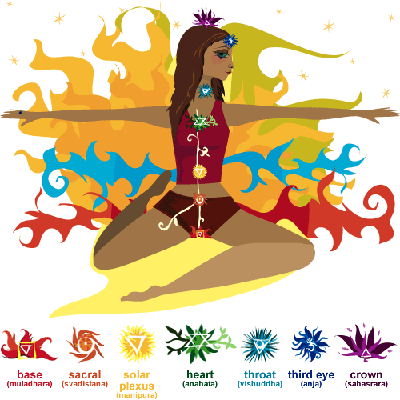 You’ve got a handful of poses to look at (in both Sanskrit + English), plus the chakras. It even comes with a handy dandy little mug coaster. Holds 12 oz of your fave drink. 4. 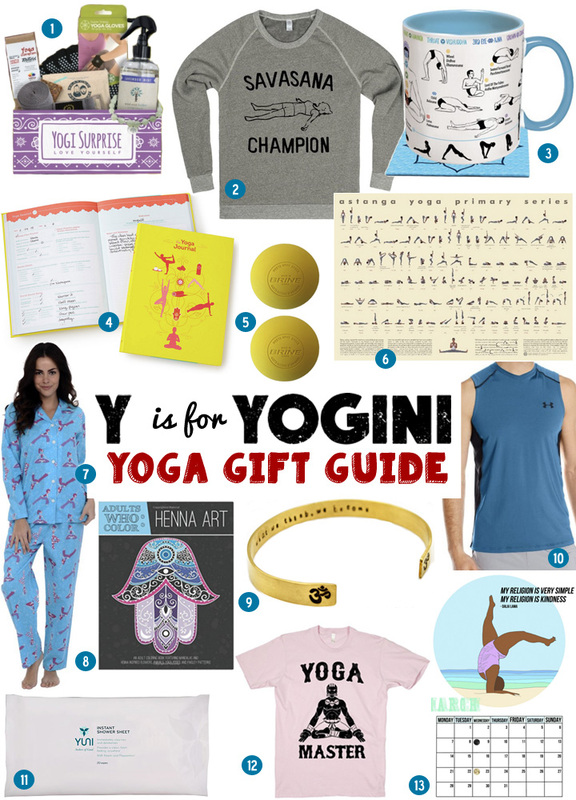 The Yoga Journal (CHRONICLE BOOKS / $16.95) – For the yogi/ni who LOVES details + chronicling their yoga practice adventures. This journal doesn’t mess; it’s rather intensive. Includes fill-ins and multiple choice for date, time of class, studio, teacher, rating, class level, crowd level, heated/unheated, session details, music, pace, sequencing, difficulty, fave pose, most challenging pose, notes, and a ton more. Wowzers. Odds are, you know someone who this is perfect for. 5. Lacrosse Balls (aka Yoga Massage Balls, according to YIFY) (BRINE / $10.99 for a set of 2) – Why waste your money on fancy-pants “yoga balls” when you can get these fab ones for a few bucks?! I have this exact set and they rock. They’re just the right firmness to get in deep and I often use them against the wall so I don’t grind my bones, though your booty muscles will loosen up greatly when you roll on the floor. Hurts so good. Only downside is, they do smell quite rubbery, but that’s what they’re made of. These are excellent for working out knots and hurty tautness. 6. Ashtanga Primary Series Yoga Poses Poster (YOGA LIFE STYLE / $20) – Easy-access yoga pose inspo? This poster works. 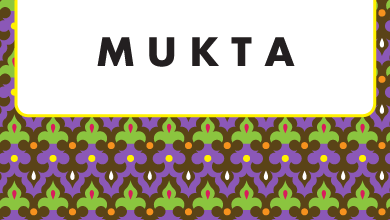 It details the Primary Series taught as part of an Ashtanga Yoga practice and includes accompanying Sanskrit pose names. Size is 20″ x 28″. There’s also a smaller, laminated version available at the same link above. 7. 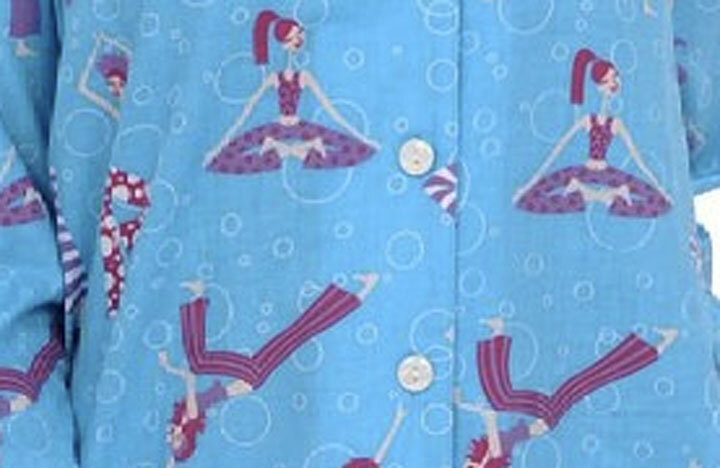 Yoga Pajamas (DEL ROSSA / $22.99-$26.99) – Snuggly 100% cotton flannel yoga print pajamas! Best for practicing Savasana (hee hee). Sizes from S to XXL. 8. Adults Who Color: Henna Art Coloring Book (ZING BOOKS / $7.99) – I was coloring before it was “cool” and I’ll still be doing it after the “trend” dissipates. Coloring is amazing for opening your mind, encouraging flow, and dissolving stress. Ahhhhhhhhh. You need a coloring book and so does everyone you know. This one is particularly gorgeous (mandalas, yoga poses, animals, flowers!) 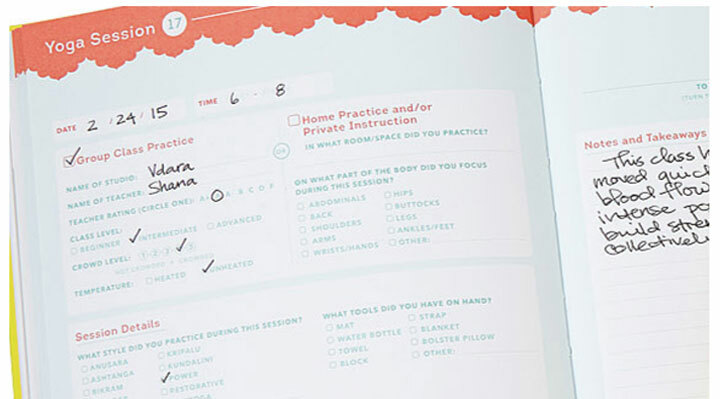 + has 50 one-sided pages (very helpful if you like to use markers). 9. Om Brass Cuff Bracelet (LOVE IT PERSONALIZED / $29) – I love this cuff. YOU get to CHOOSE what secret message is hand-stamped inside! And you get to pick the finish (polished, brushed, or hammered). So personal, so unique, + a very special gift. 10. Raid Sleeveless Tee in Petrol Blue (UNDER ARMOUR / $17.99) – UA has a strong rep and makes superbly functional workout clothing. This tank/vest is perfecto for yogis — soft, stretchy, and breathable (mesh panels under arms + on back). Sizing runs from S to XXXL and the color choices are broad (teal, white, navy, black, royal, red, cobalt, and yellow. Fabric: 90% polyester/10% elastane. 11. Shower Sheets (YUNI / $12 for 20) – I’m a wipes fanatic. But you don’t have to be a germophobe to appreciate cleanliness and these shower sheets make post-workout or yoga session cleanup easy peasy. Especially if you or your giftee refuses to shower anywhere but home sweet home! They smell nicely herbal (peppermint + neem), are non-toxic, plant-based, biodegradable, AND compostable. The package is resealable and lightweight. High five for fabulosity. Yuni rocks. 12. Yoga Master T-Shirt (PRINTOPOLY / $29.99) – Tongue-in-cheek yoga humor = love. Just looking at this tee makes me smile. That’s exactly how it should be. Sick with jeans, funky cool with a blazer, adorable with a flirty skirt. Comes in pink, light blue, white, + gray. Styling is unisex. Sizes: S to XXL. Fabric is a soft 90% cotton jersey/10% poly blend. Say YES to being a Yoga Master. 13. 2016 Yoga Calendar (YOGA WILL SAVE THE WORLD / $15 CAD, which converts to $10.93 USD) – I am a fan of the artist’s illustration style and this calendar is fun + cute, with an inspirational quote for each month. Love the diversity in the yogis and yoginis depicted. This is printed on 100% recycled paper with eco-friendly inks. Merry gift-giving and much love to you. xo! Oh great gifting list! I love all of these items, thank you for sharing.